Ray Donovan is one of those shows that has always been good, but has never quite been good enough to be mentioned alongside the best shows on television. All that changes with Season Five, in which the showrunners make a bold decision to off one of the lead characters - resulting in the kind of drama and emotional impact that most TV series only dream about having. The character who says goodbye isn't a spoiler, as it's revealed in the Season Five premiere: it's Abby Donovan (Paula Malcomson), the wife of Ray (Liev Schreiber), who had a breast cancer scare in Season Four, although that's not what kills her. Season Five begins in the aftermath of her passing, and one of the big mysteries of the episodes that follow is the question of how exactly Abby dies. This also allows the show to jump back and forth in time as the season unfolds, and still permits Malcomson to appear in the majority of the episodes. Our other main characters have gone through some changes as well, most notably Ray's older brother and Parkinson's sufferer, Terry (Eddie Marsan), who has had a surgical procedure since we last saw him that stops his hands from shaking and gives him back the ability to control his motor functions. Terry has some relationship problems of his own to deal with and - later in the season - he must also face off against Ray as Terry has to reveal to him some information about Abby's passing of which Ray was not yet aware. 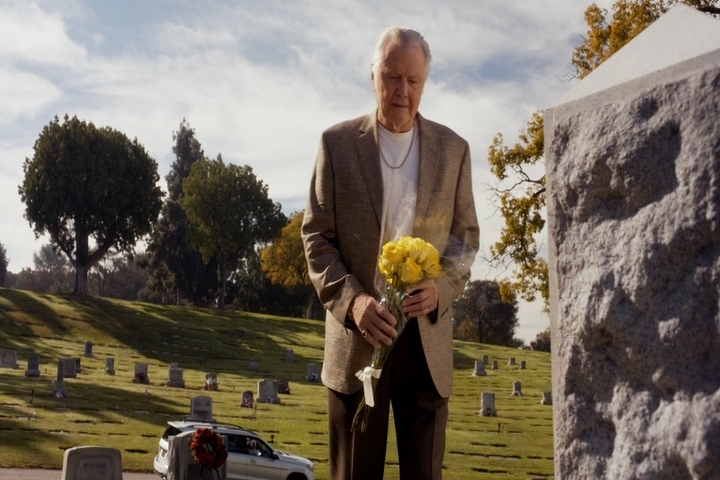 One of the fun things about Ray Donovan is seeing what scheme Ray's father, Mickey (Jon Voight), will get wrapped up in each season. He always seems to have some kind of scheme or con running that winds up getting him into trouble. This season, however, trouble finds Mickey on its own. When he and his son, Daryll (Pooch Hall), assist in the cover up of an accidental death caused by movie star Jay White (Brian White), Mickey sees it as the perfect opportunity to finally get his screenplay made into a movie - blackmailing White to do so. And then there's poor Bunchy (Dash Mihok). Does anything ever go right for this guy? This season he's given an investment opportunity (Bunchy has $1 million dollars from a court settlement he hasn't yet dipped into), and it's no surprise to say that things don't go well for perhaps the dimmest of the Donovan boys. Not only does he lose the money, but when he winds up in jail (for an unrelated reason), he finds himself locked up with one of the very guys who stole his cash. As for Ray, his arc in Season Five isn't completely Abby-related. He's been working for Hollywood mogul Samantha Winslow (Susan Sarandon) and his interactions with her have led him to get involved (both professionally and physically) with starlet Natalie James (Lili Simmons), who has an abusive husband and is pregnant by another man. But the real power of Season Five is seeing how all these characters - particularly Ray - react to the loss of Abby. Here's a guy who makes a living as a "fixer" and who always can work his way out of a difficult situation. To see him as helpless and as lost as we do in these episodes (and to watch Schreiber's powerful acting - the best he's done in this series...and perhaps his career) is the real reason to add this release to your collection. Ray Donovan evolves in Season Five, and it's a welcome change. Season Five of Ray Donovan hits DVD in a clear case (for those wondering, yes, Showtime has completely abandoned Blu-ray releases for this series), with the four dual-layer discs held on a pair of plastic hubs inside. The reverse side of the case's slick (seen from inside the case) has a list of all the episodes from Season Five and a short synopsis of each, along with any bonus materials that appear on the respective disc listing. The case slides inside a cardboard slipcase featuring the same artwork that is on the slick. There are no front-loaded trailers on any of the DVDs, and the main menu features a still photo of Ray on the left (the same one that graces the box cover), with a montage of footage from the season in the upper right and menu selections on the lower right. Each episode of Ray Donovan was shot digitally on Arri Alexa cameras and are presented here in the 1.78:1 aspect ratio using an MPEG-2 codec. As DVDs go, the Ray Donovan releases have always provided fairly decent transfers, and this latest season is no exception. While there's a touch of aliasing and noise here and there, there were no major glitches or glaring problems that I noticed in the 12 episodes of this DVD set. Details are pretty good given the limitations of DVD, and the anamoprhically enhanced image is on par with the previous releases. As with prior DVD releases, the only audio option for each episode is English 5.1 Dolby Digital Surround. Dialogue is always clear and exclusively front and center. The surround speakers are primarily used for various ambient noises and to enhance the soundtrack (the end credits always include a pop or classic tune). While there's bits of action to be found in Season Five, this might be the most drama-centric season of Ray Donavan to date, so aside from a number of fights and a few instances of gun play, there aren't any big shootouts or car chases this season that might help amp up the audio. Still, these tracks are on par with the seasons that preceded them on DVD, and owners of prior releases will know what to expect here. Dog the Dog (2:13) - The huge dog (whose real name is "Rock") that belongs to Ray and Abby doesn't get a whole lot of screen time in Season Five, but here's a look at how it came to be on the show, with some humorous comments from the cast. On Death & Dying: Part 1 (5:15) - Executive Producer David Hollander and members of the cast talk about the decision to say goodbye to the character of Abby in this latest season, and the reasoning behind that hard choice. Nothing Goes Right for Bunchy (3:03) - Dash Mihok talks about his character's arc in Season Five, which - of course - has Bunchy getting in over his head once again...this time involving a hold-up at a sub shop. Terry Donavan and Parkinson's (3:03) - Eddie Marsan discusses his portrayal of the Parkinson's-stricken Terry, who gets surgery this season that allows him to regain control of his motor skills. On Death & Dying: Part 2 (7:42) - In this second part, Executive Producer David Hollander talks about how Season Five jumps around in time to tell Abby's story and how he wanted it to be the focus of the entire season, rather than just a couple of episodes. Episode 508 Commentary with Paula Malcomson and David Hollander - The actress who plays Abby joins the series' Executive Producer for a commentary track on the episode "Horses", which is Abby's swan song on the show (although she does appear in later episodes). This track is a great listen, due largely in part to the fact that it's also Malcomson's first viewing of the finished episode. On Death & Dying: Part 3 (8:50) - In this final part, Executive Producer David Hollander and star Paula Malcomson talk about saying goodbye to Abby and the lasting impact her absence will have on the other characters. In Season Five, Ray Donovan takes the leap from being a good television series to being one of the best shows on TV. It takes a huge risk by saying goodbye to one of its major characters, but it pays off - allowing the remaining actors to do some of their best work ever. Needless to say, this release is one that is Highly Recommended.